Help your aging parent overcome resistance to medical care with this strategy. Let’s face it: lots of us put off visiting the doctor’s office. It might be awkward and downright frightening when something is wrong and we’re confronted with the prospect of an unwanted diagnosis. However, we know it’s wise to do what is best for our health and wellness as well as be conscientious about getting essential healthcare. 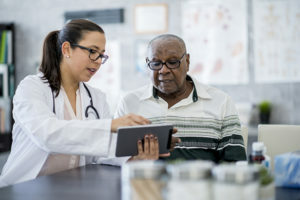 For seniors, a number of other issues come into play as well, oftentimes resulting in the decision to bypass that check-up or follow-up appointment, even if it is obviously not in their very best interest. When an aging parent digs in his heels, refusing to visit the doctor, it’s important to first realize why the resistance is occurring, to address those concerns, and then to understand how best to provide encouragement. One of many reasons older adults avoid medical appointments and procedures is fear. It may seem safer and simpler just to disregard symptoms and hope they will fix themselves on their own. For others, the concern can be financial. Or they could desire to steer clear of the awkwardness of being reminded of a weight problem, or to acknowledge living an unhealthy lifestyle. Regardless of the cause, the bottom line is that it’s crucial for senior loved ones to manage their own health, which calls for routine medical examinations and remaining proactive in bringing to light any worries. So as an adult child, how do you best help alleviate your aging parent’s objections to seeing the doctor? You may be pleasantly surprised at how readily your aging parent will agree, realizing that it will help you. In the event that you continue to struggle with helping your parent understand the need for proper medical care, call on Home Sweet Home In-Home Care. We are experienced in helping families with getting through the often difficult transition to accept help at home, and sometimes the recommendation of a professional, unbiased 3rd party will make a world of difference in alleviating concerns and shifting the focus towards the many benefits of in-home care. Contact us online or call us now at (269) 849-9252 in St. Joseph, 269-763-5350 in Paw Paw, 269-963-9888 in Battle Creek or 269-373-5444 in Kalamazoo.